Sorry to hear that. I will forward your issue to the product development team. How, please tell us the solution. 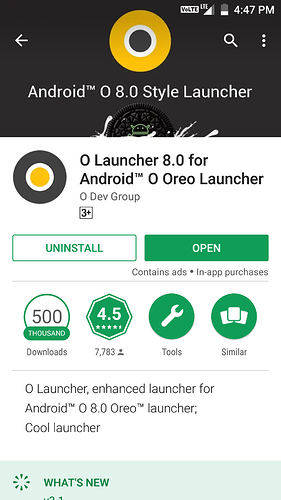 The only thing making the phone buggy and laggy is the tronx launcher and in play store there is only one stable launcher for Oreo that is Oreo launcher which is made by the Oreo developer's group and it has the Trade mark symbol also so this is a stable launcher for Oreo device which makes the whole device perform better. So this is that launcher and install it and enjoy the true Oreo launcher and a good srt phone. Thank you for sharing this. So as per your comment, customers are facing lag issues because of the default launcher and changing to another launcher may help. I will definitely forward this feedback to our team. @Abhishek_TV the launcher is only causing the problem. The tonx launcher is not stable so the stable Oreo launcher is which I have shown u above in the forum hope u can ask for the developer's to make the launcher stable and it also saves the battery a lot. @Abhishek_TV u can definitely believe me as it eyes it will solve the whole problem believe me and reduce the heating issue also some what. No the customers should change to a stable launcher which is the one which I prescribed. If someone do this method then should take the classic style not the pixel style and also remove the side screen form the launcher settings. Should turn of the data and restart the phone and use after 5-10 min. Is it true that security patches updates are disintegrated with system updates? If yes, then it would be easy to provide monthly security patches updates!! Yeah I know that tronx launcher is awesome but needs some repairs as fast as possible.
. please reply to us. We have lost data because the notes app has dissappeared.. it's not even showing up in the back up.